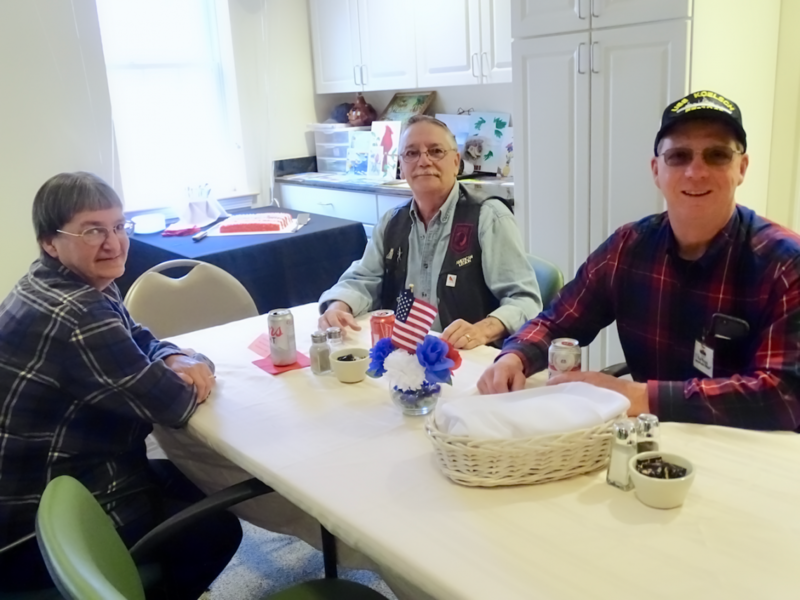 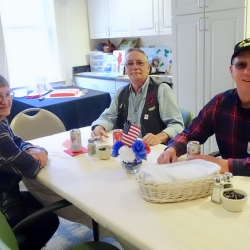 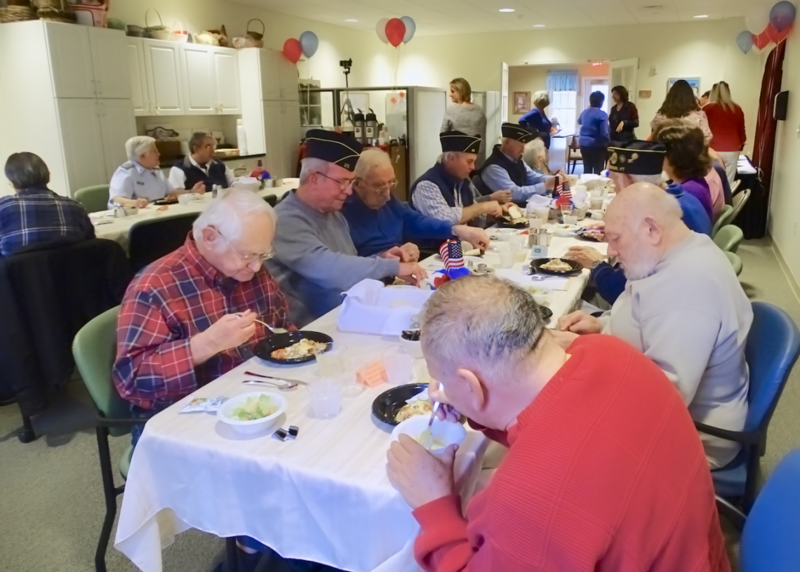 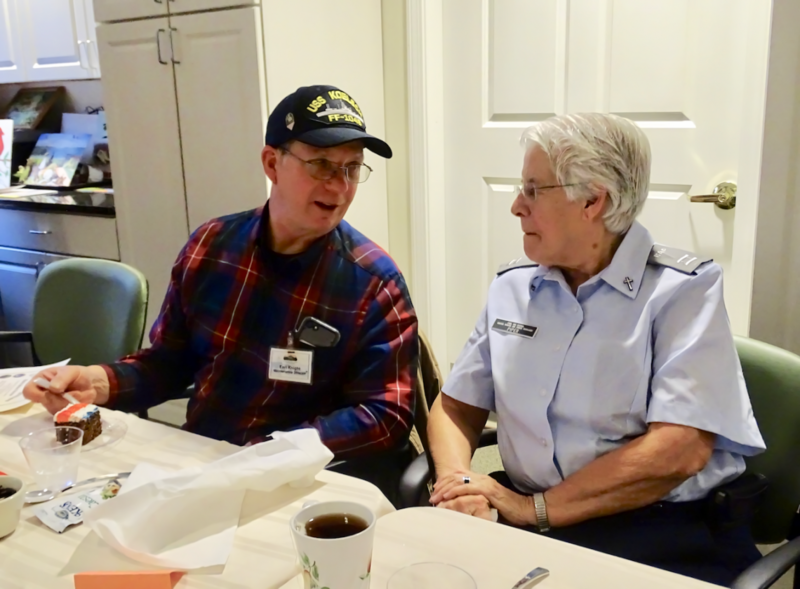 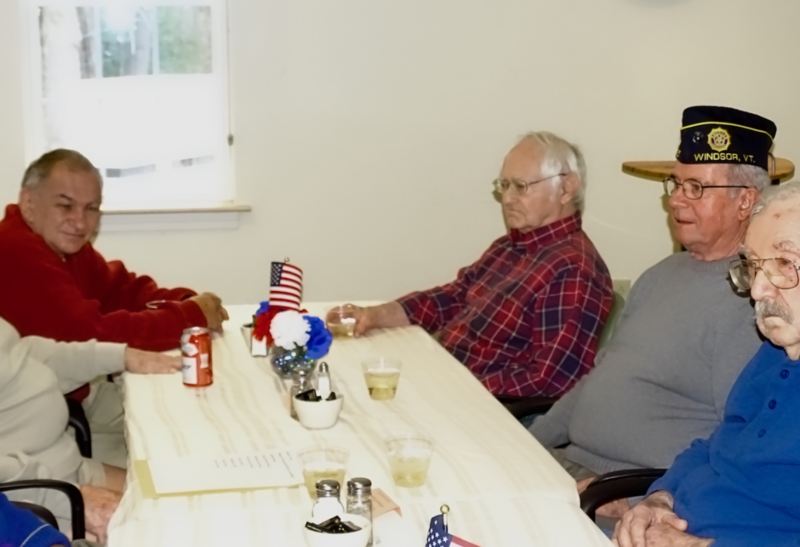 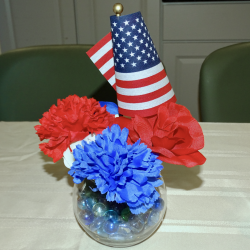 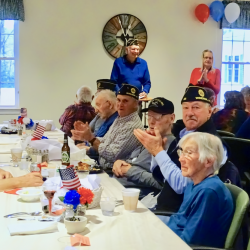 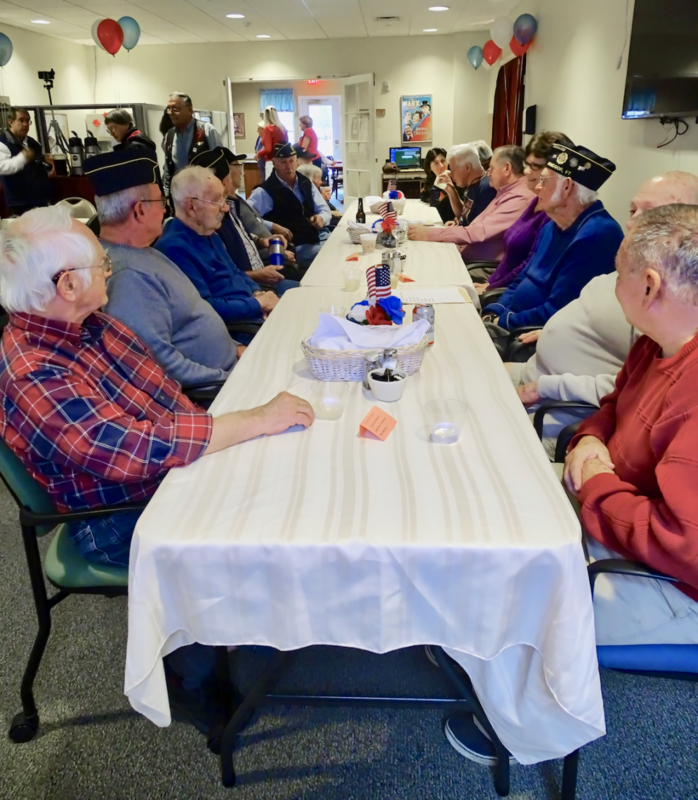 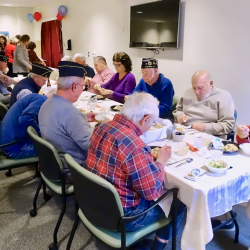 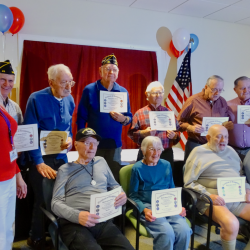 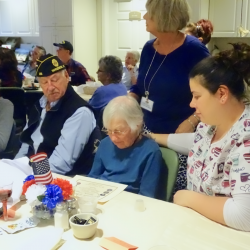 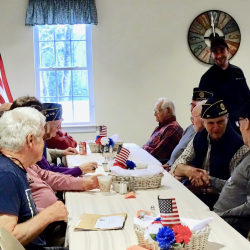 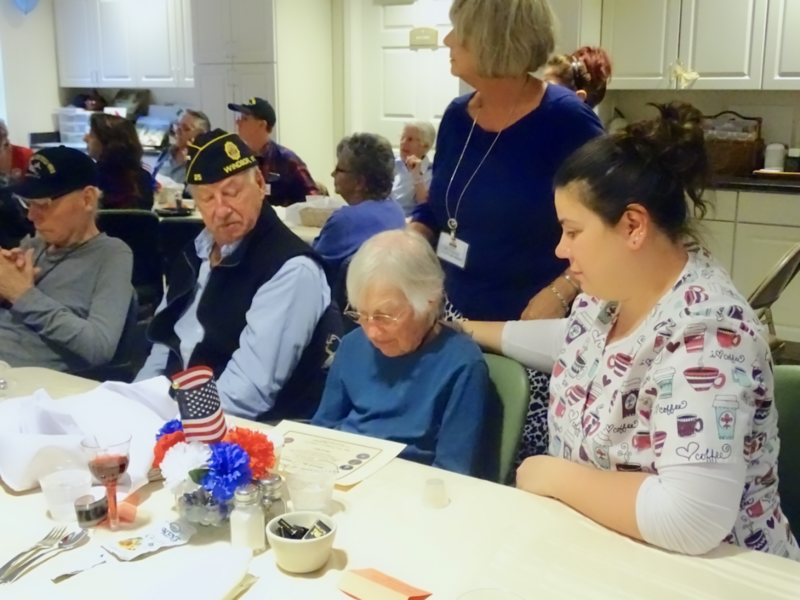 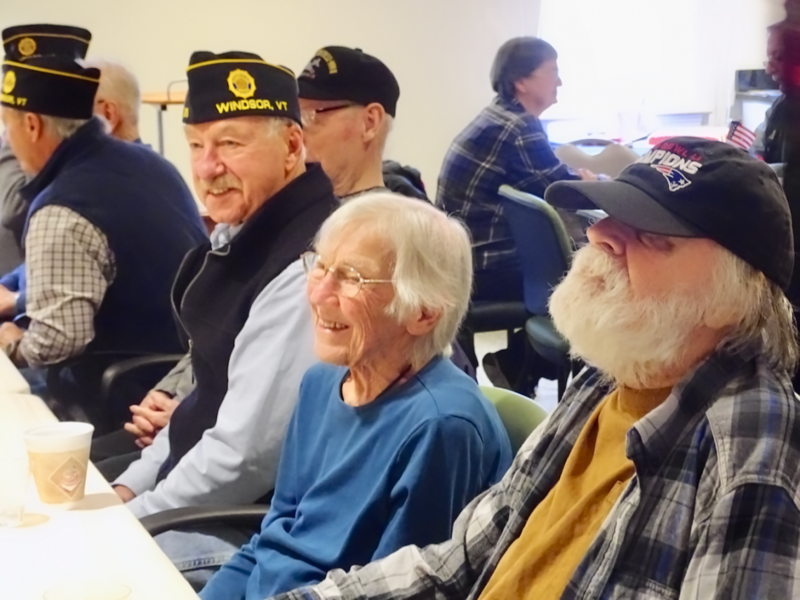 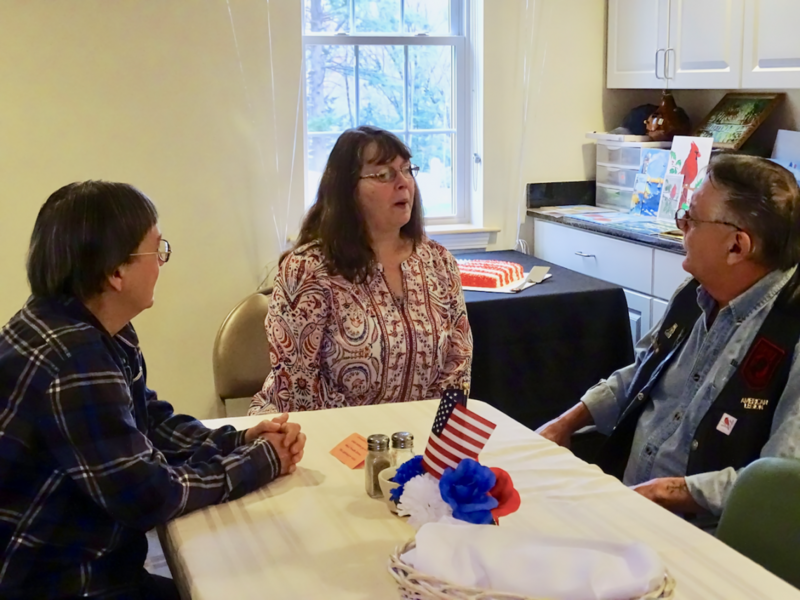 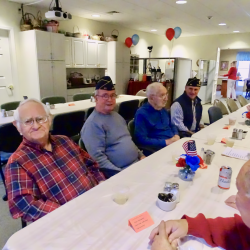 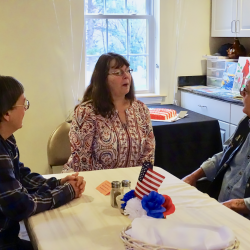 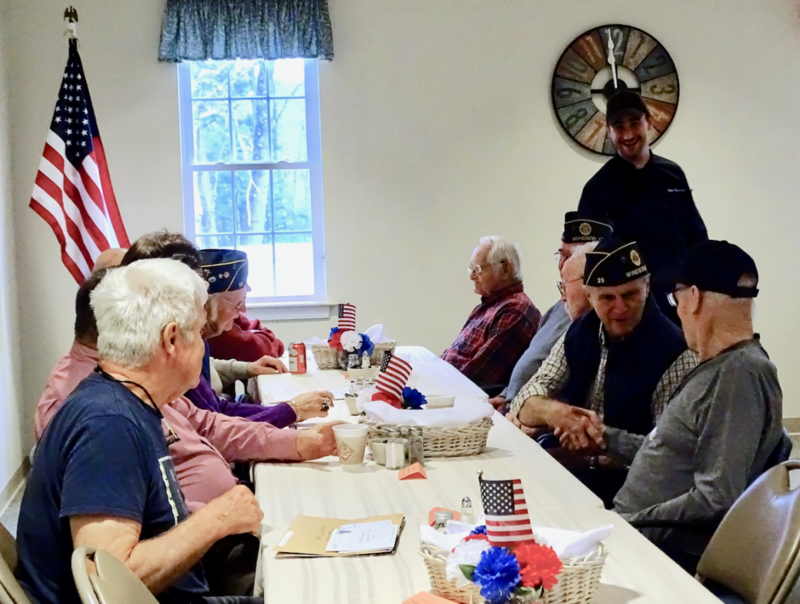 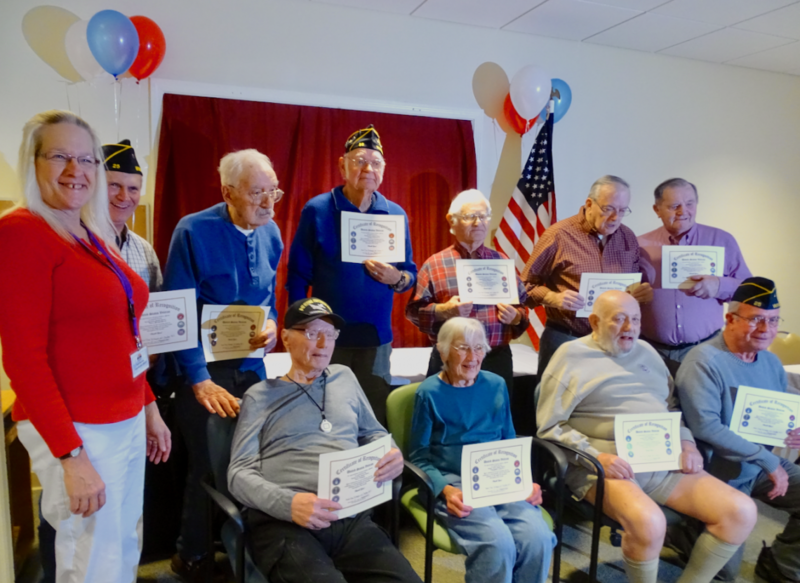 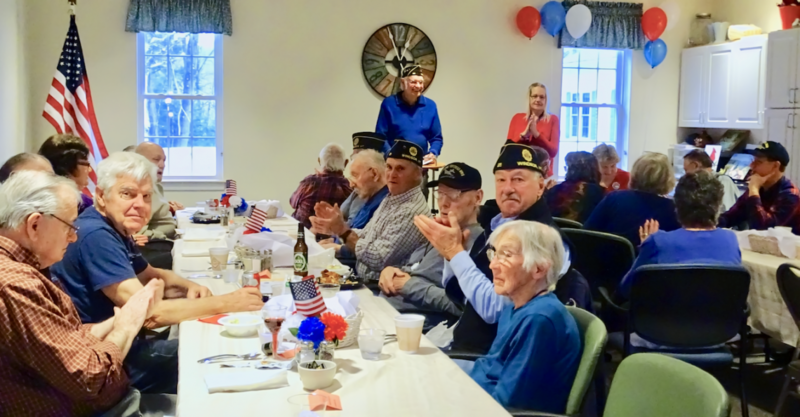 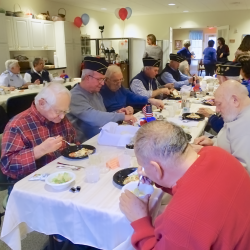 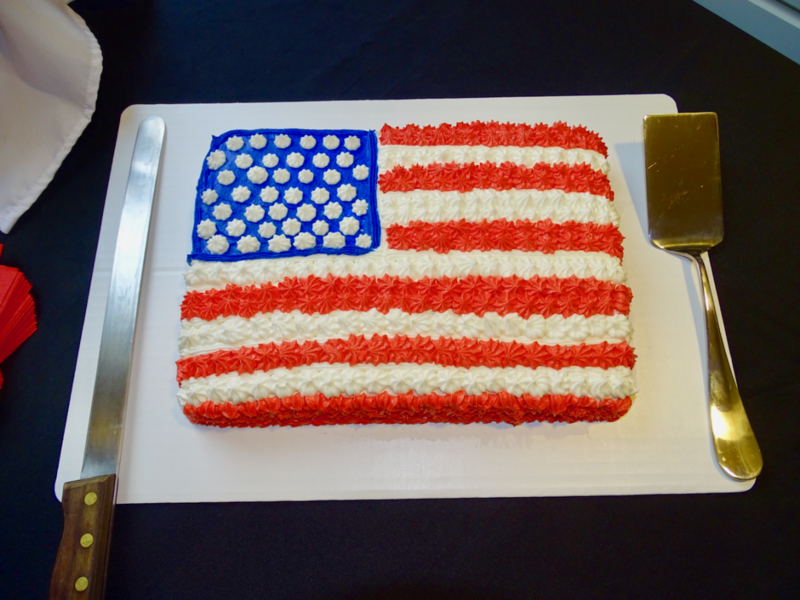 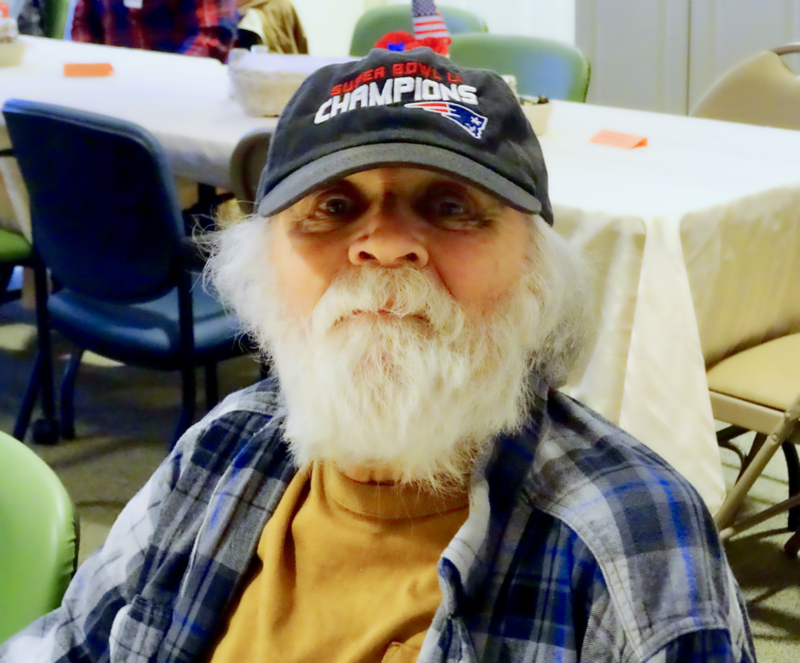 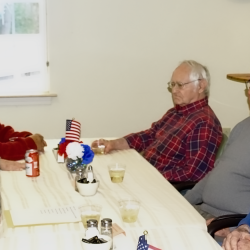 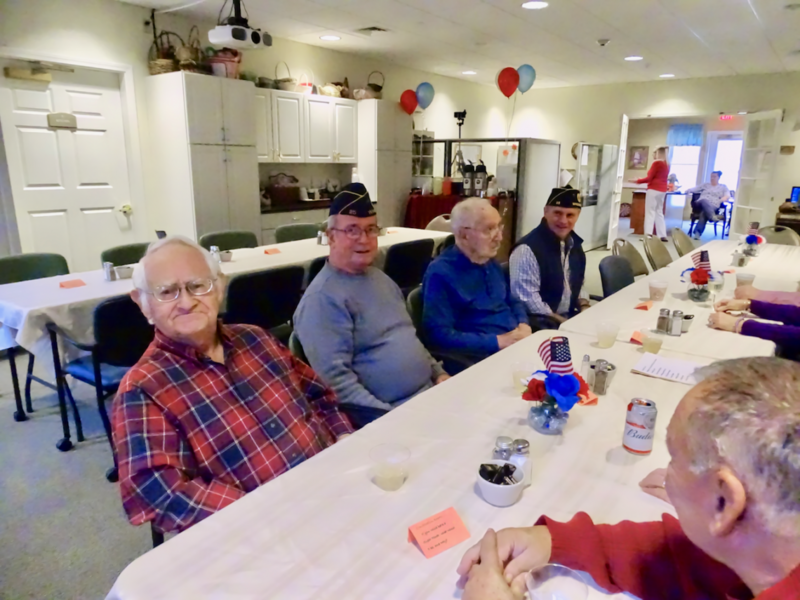 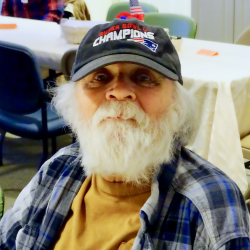 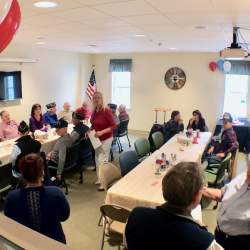 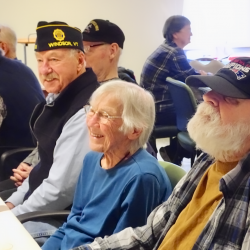 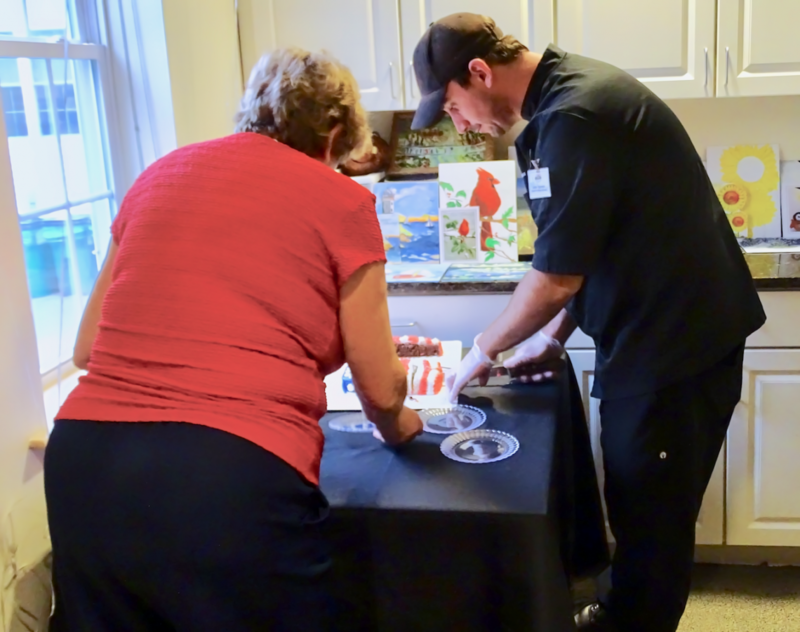 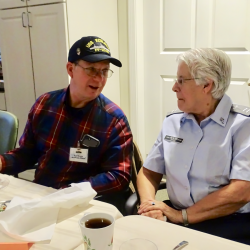 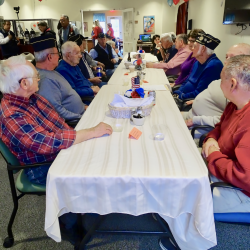 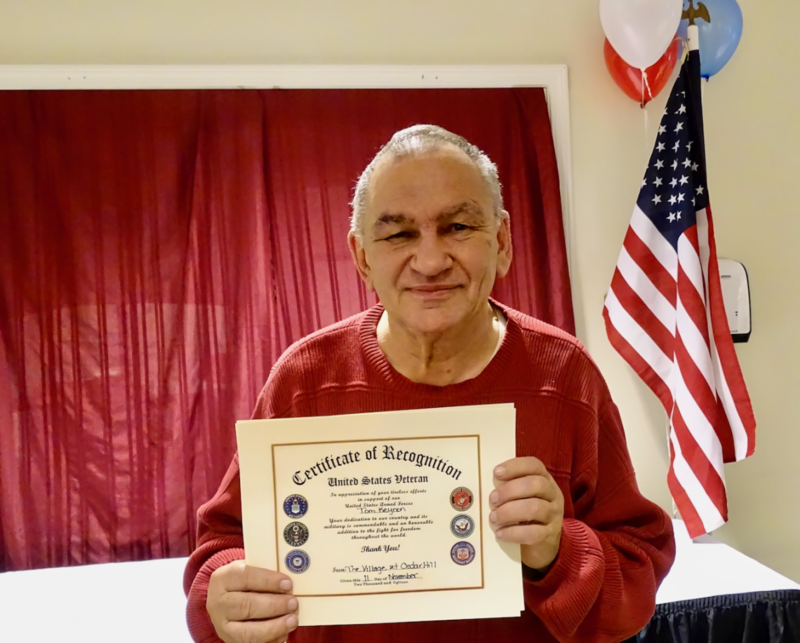 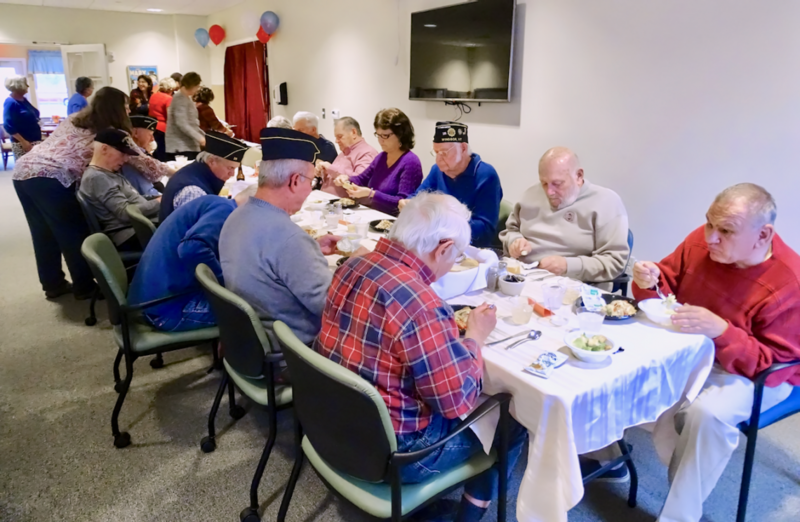 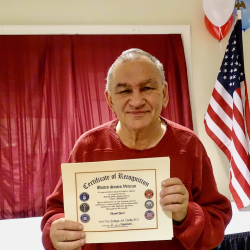 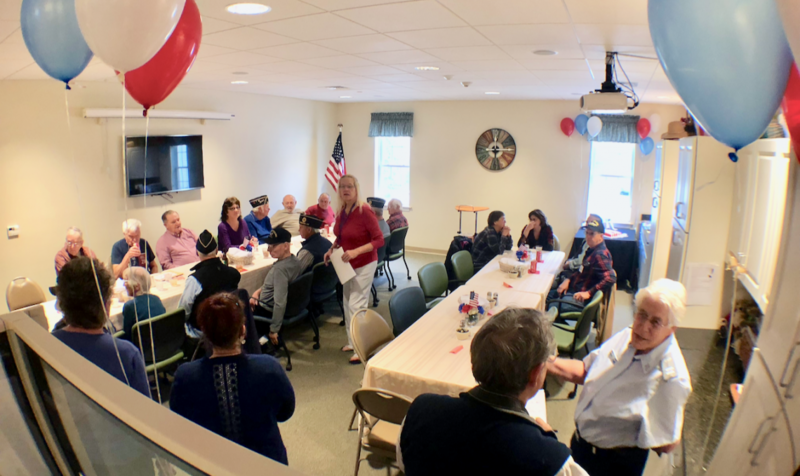 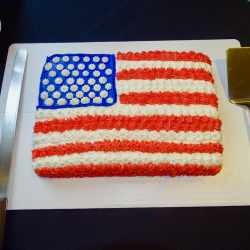 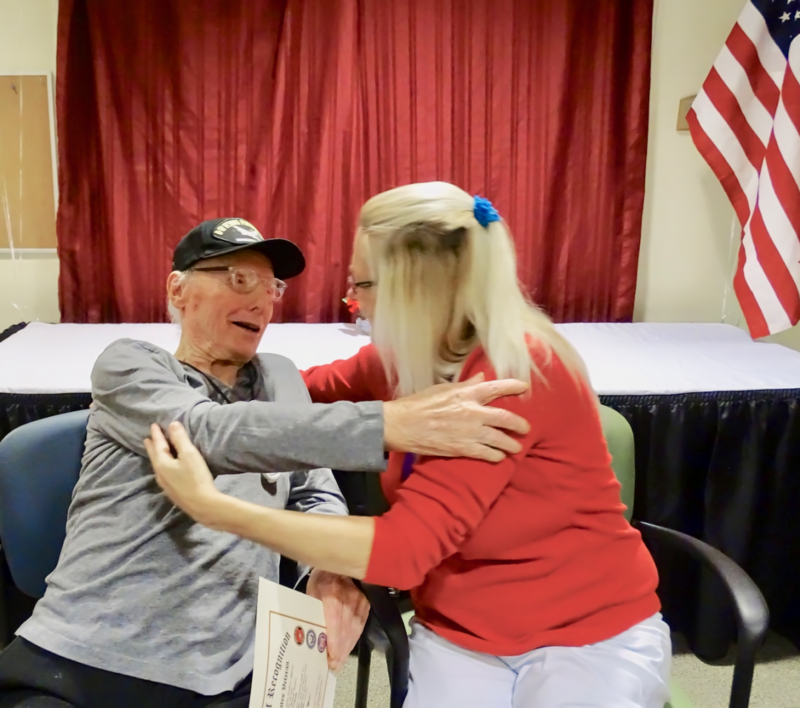 More than a dozen veterans gathered at a very special luncheon hosted at the Village at Cedar Hill on November 9 to celebrate Veteran’s Day, commemorate the 100th Anniversary of Armistice Day, and to receive the gratitude of the community for their service. 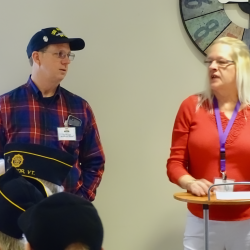 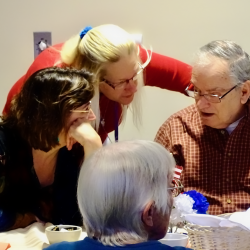 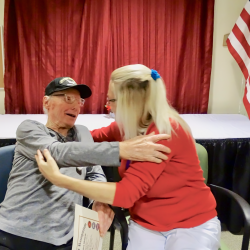 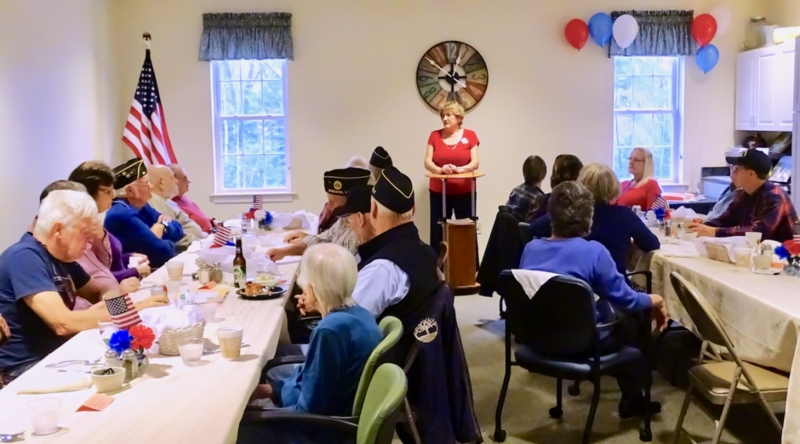 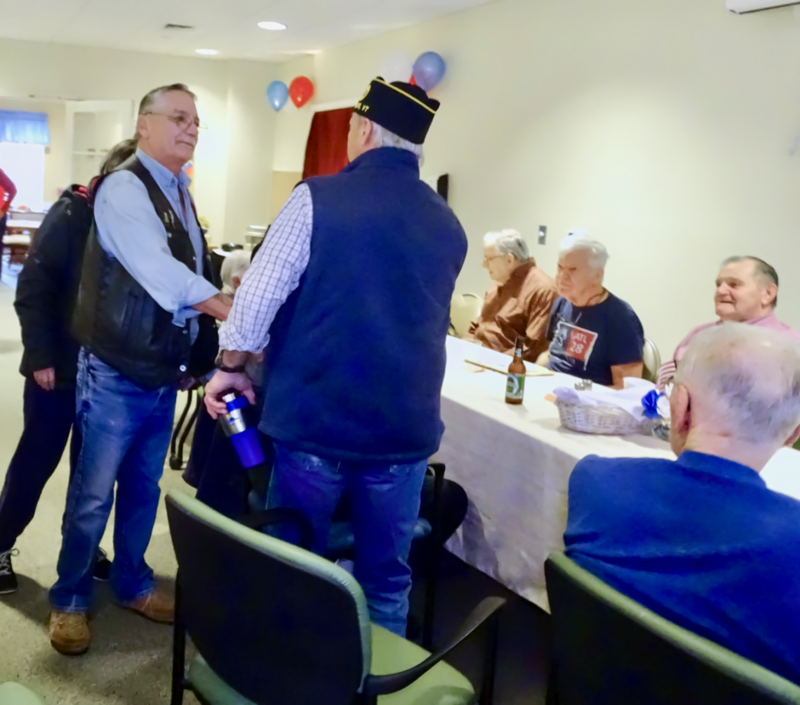 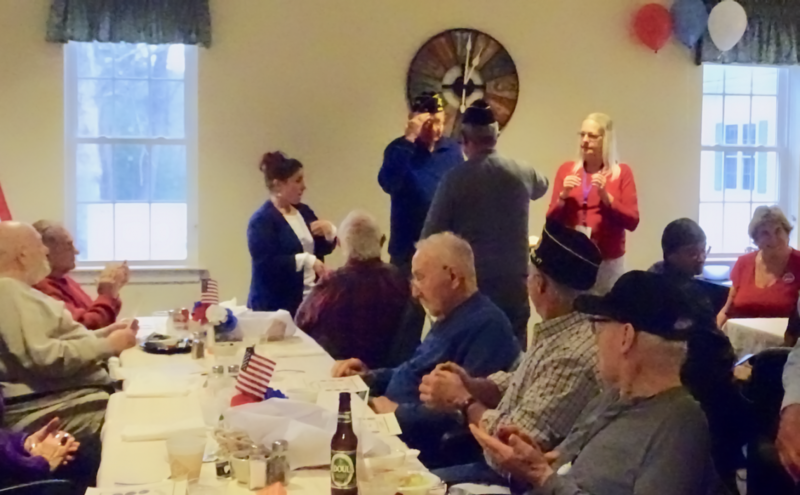 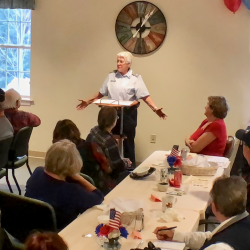 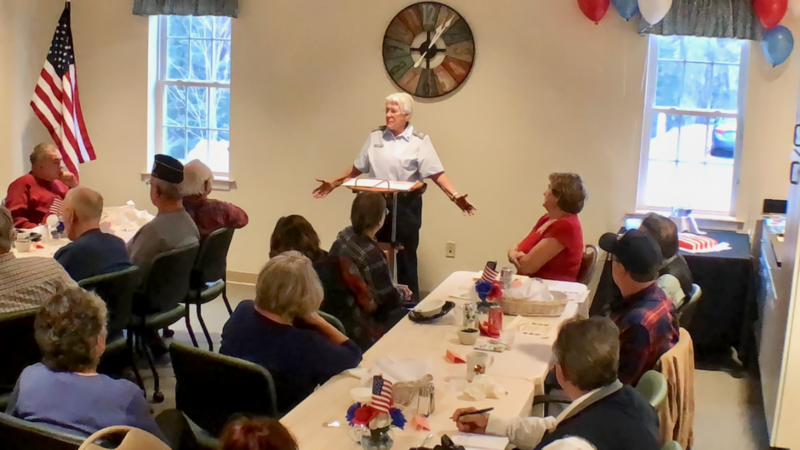 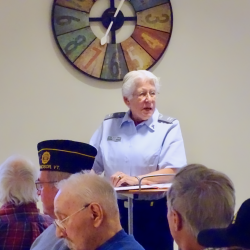 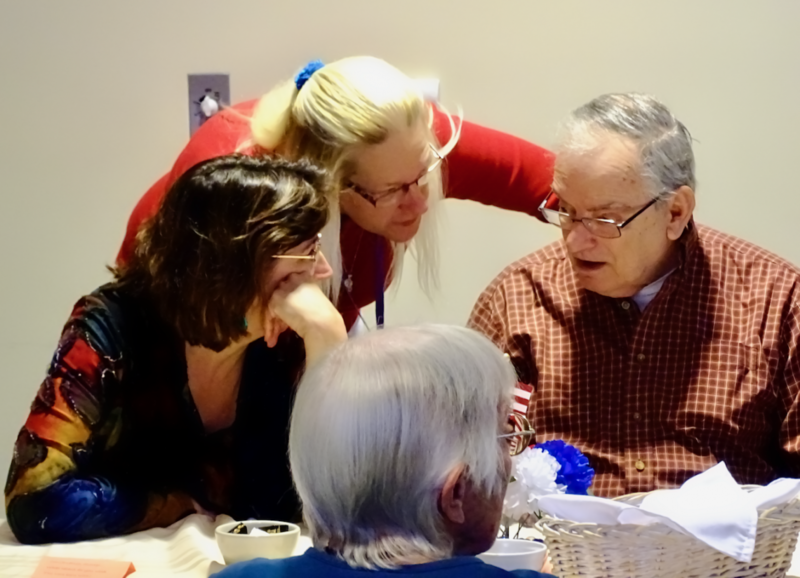 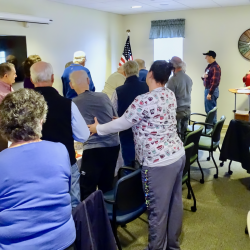 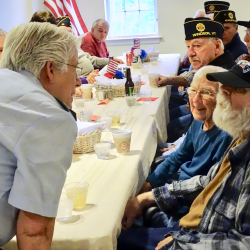 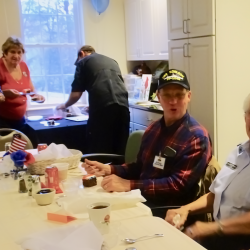 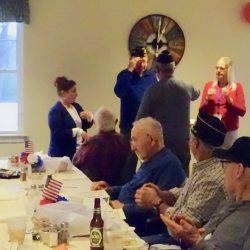 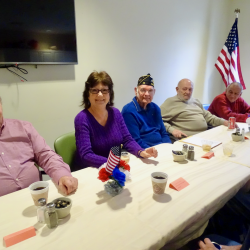 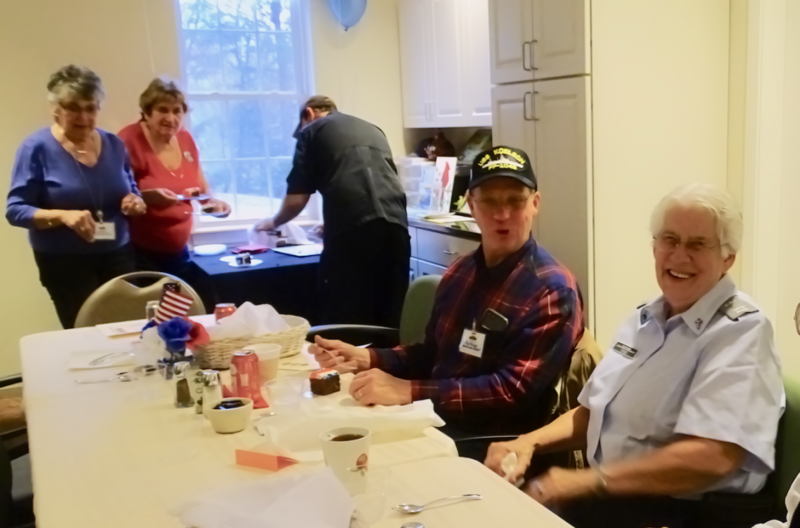 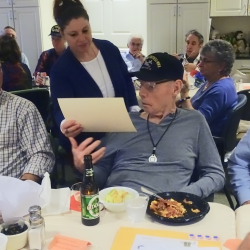 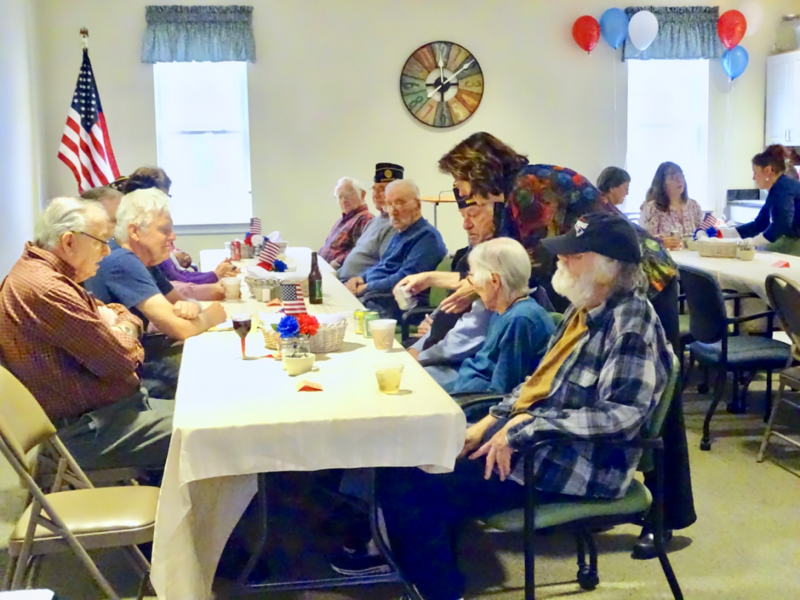 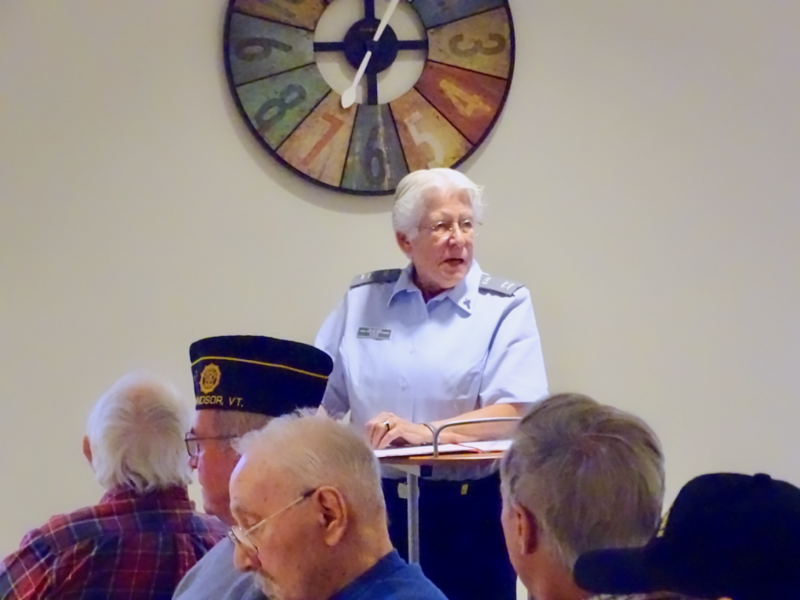 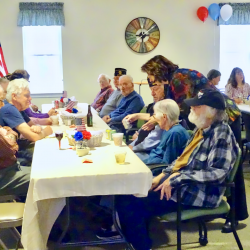 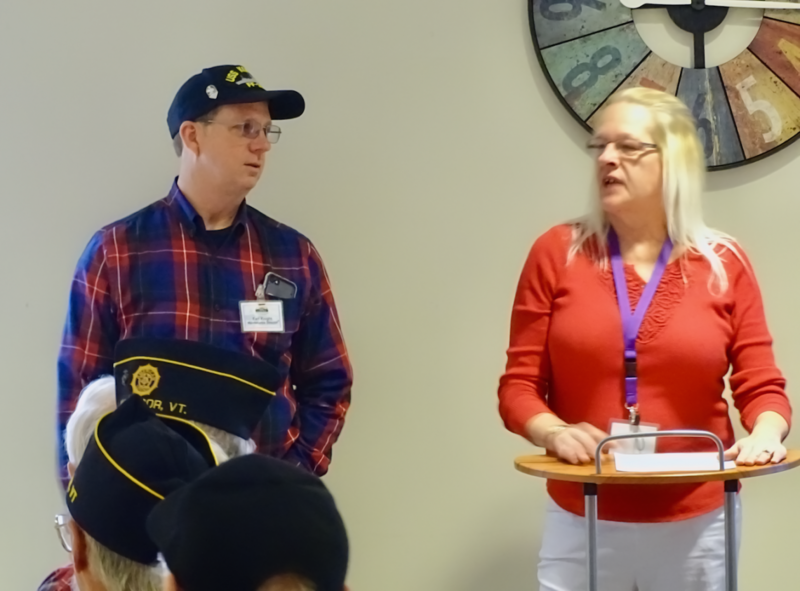 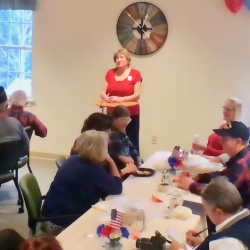 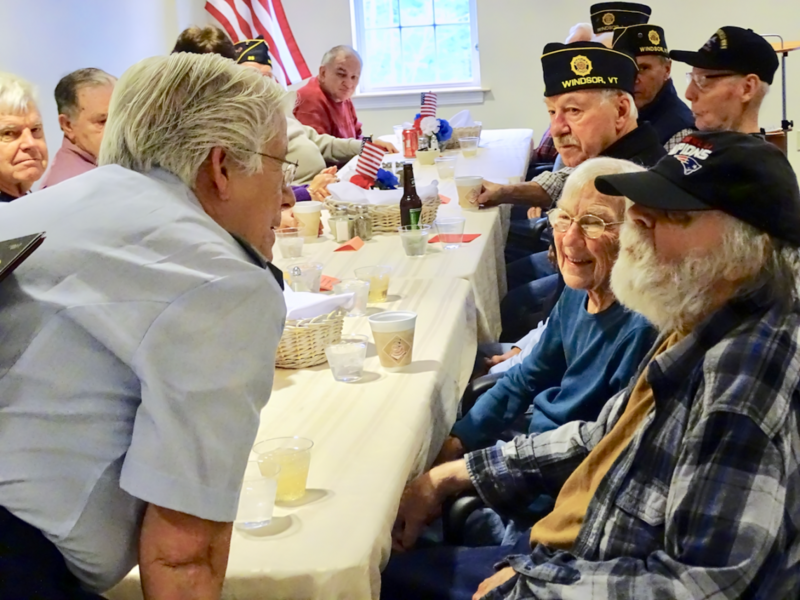 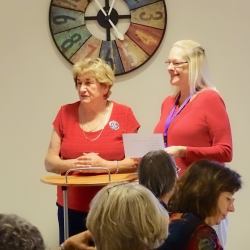 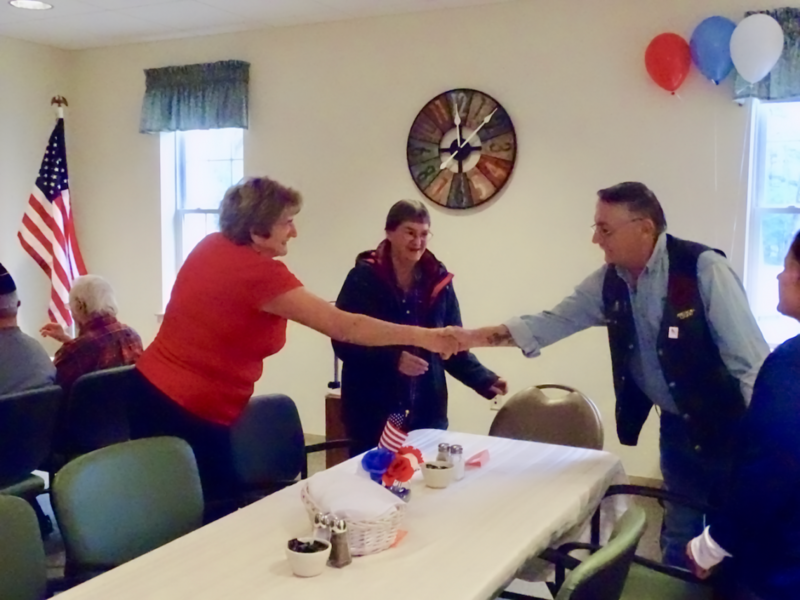 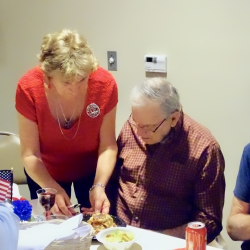 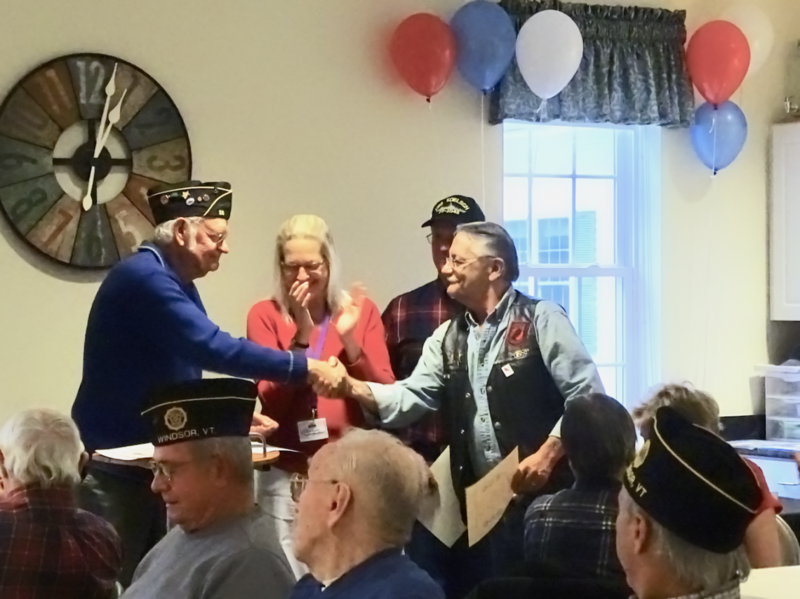 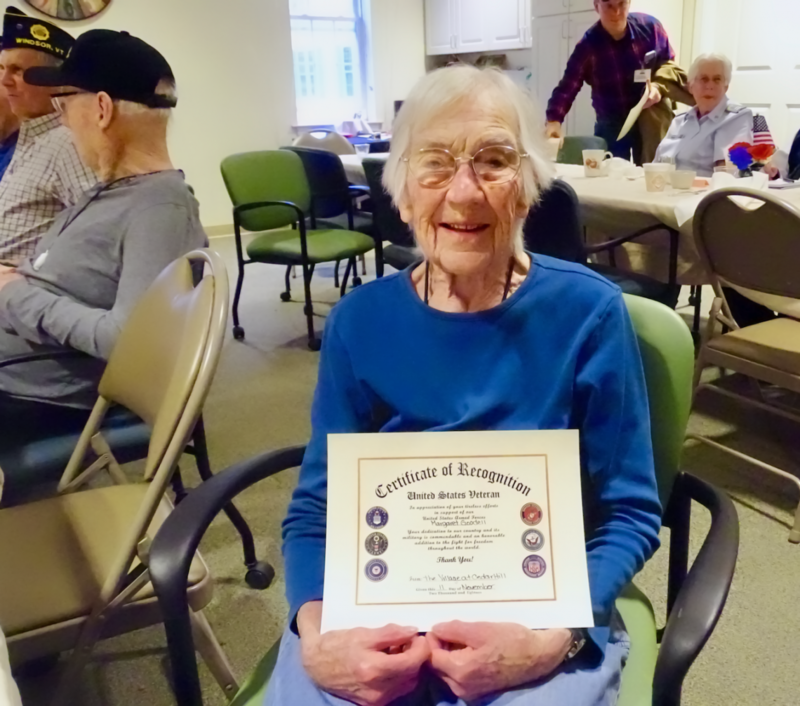 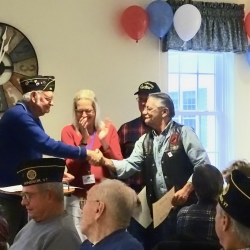 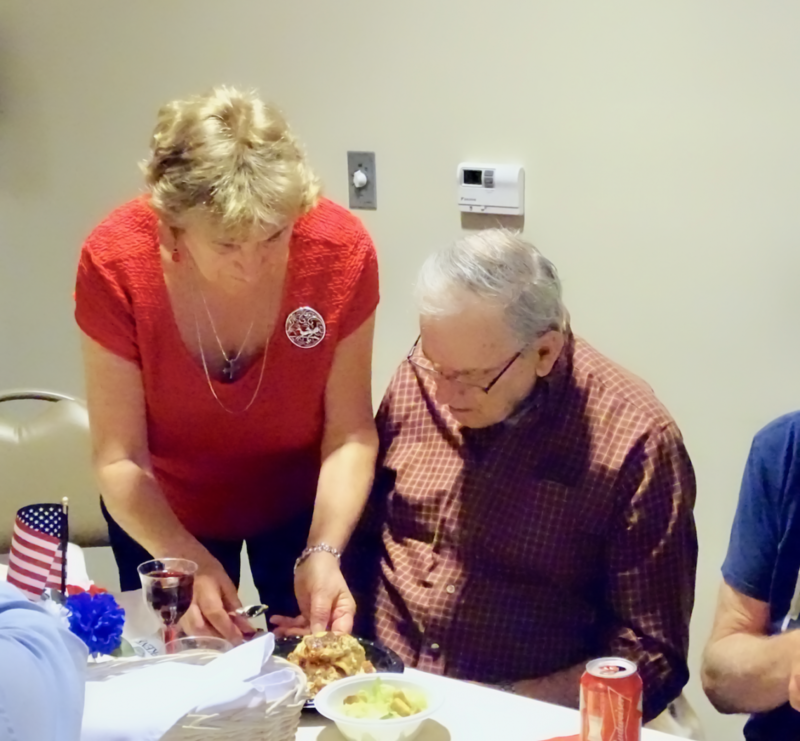 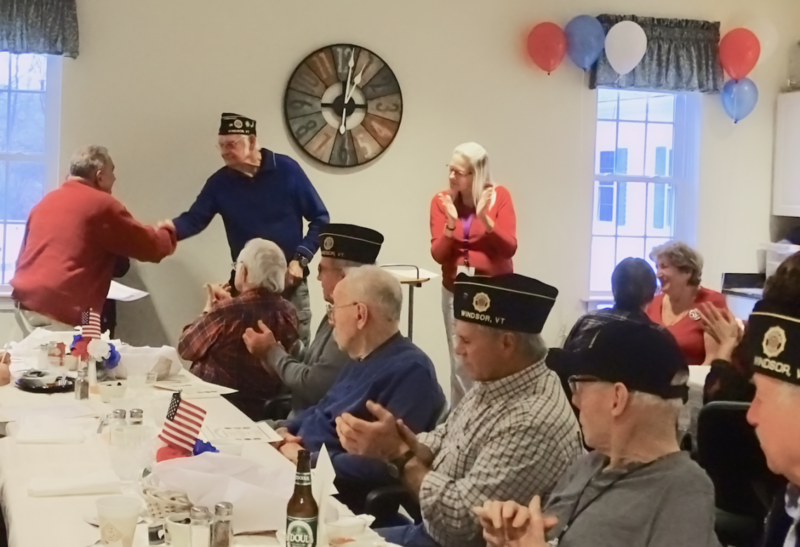 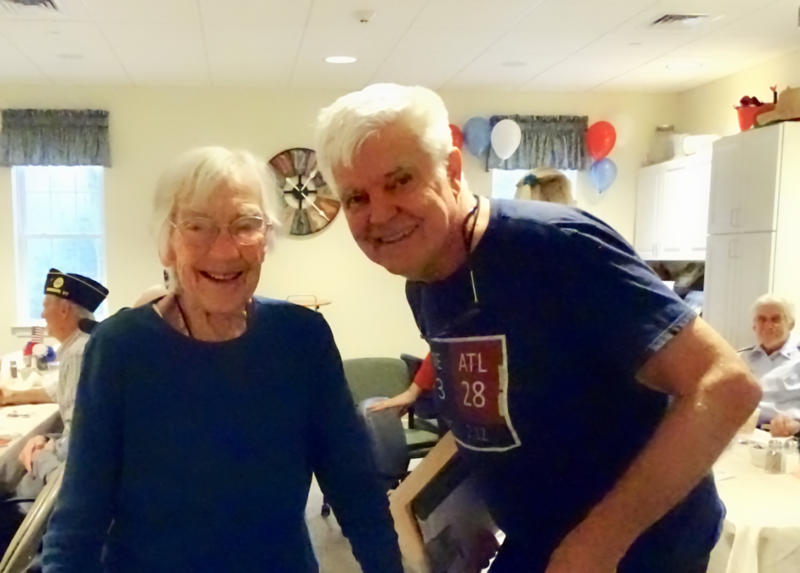 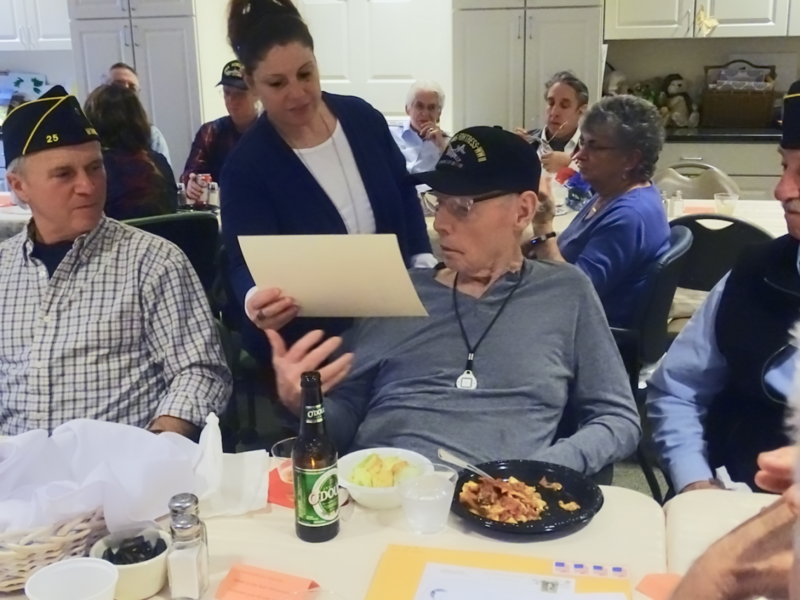 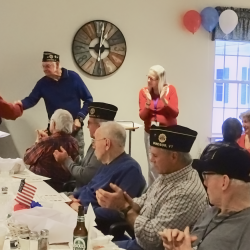 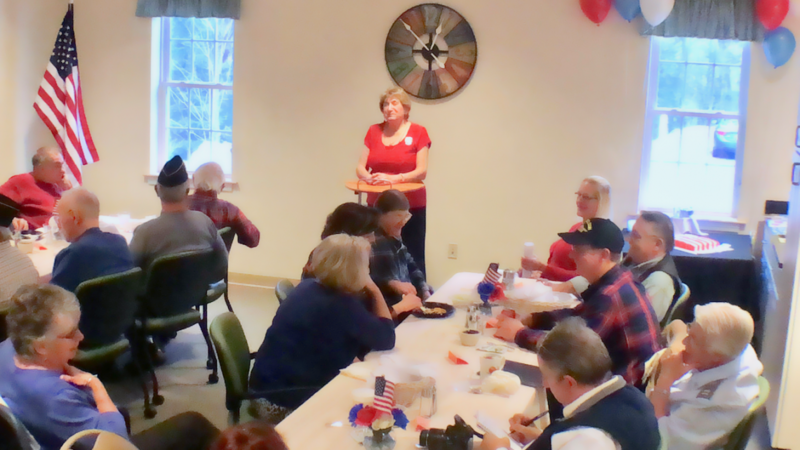 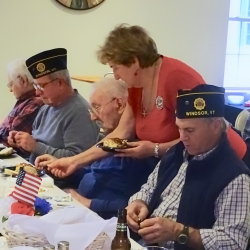 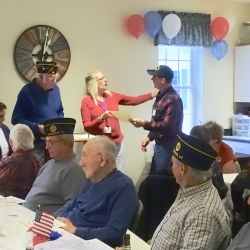 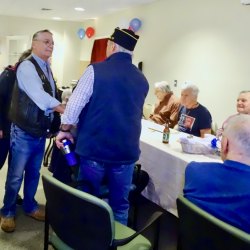 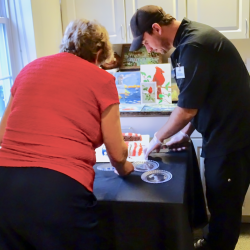 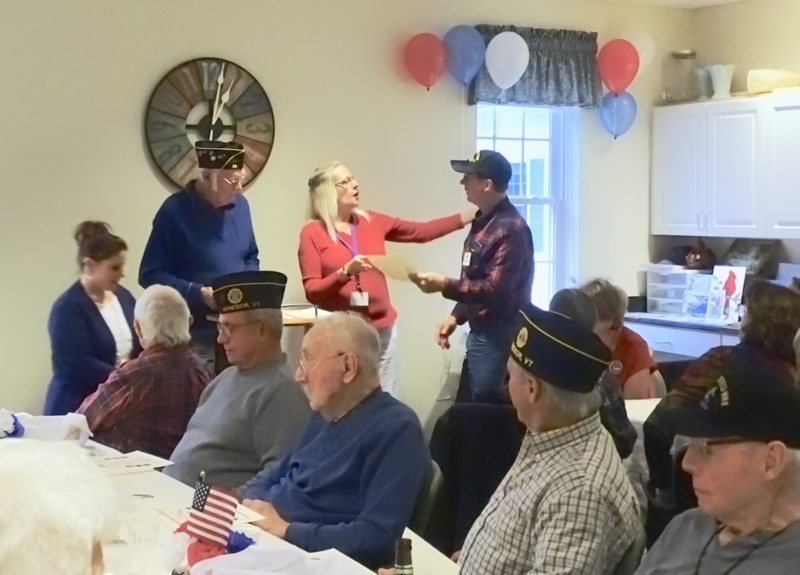 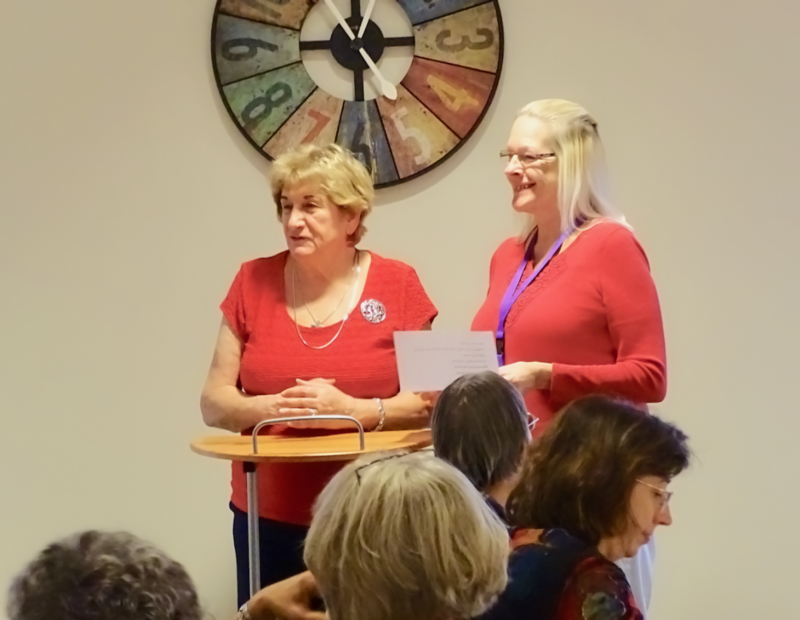 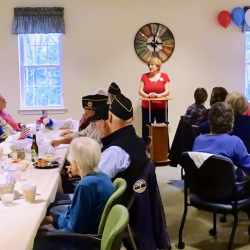 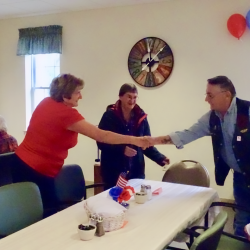 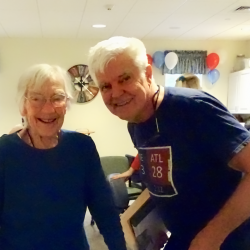 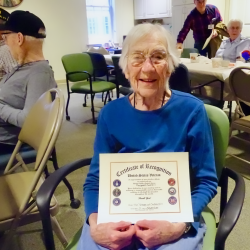 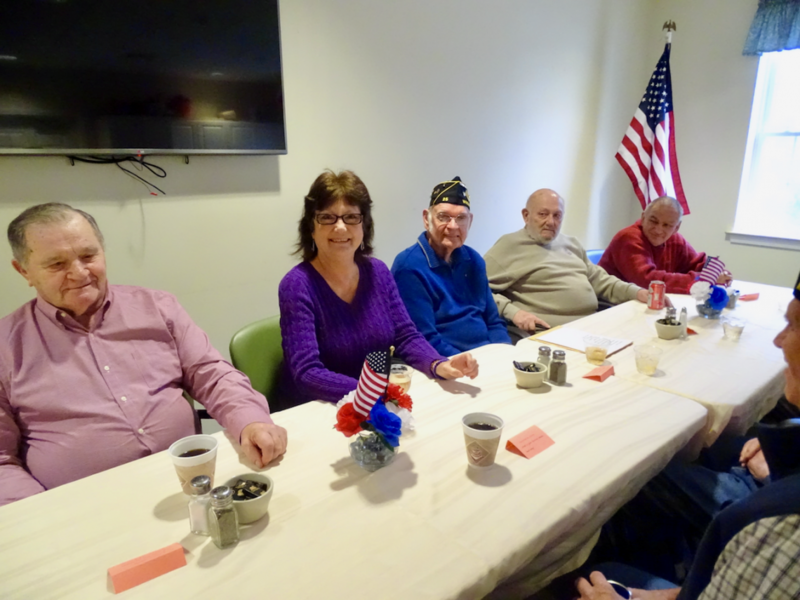 Ruth Barton, Village Activities Director, organized the event, bringing together the Veterans who live at the Village with the local American Legion Post 25 in Windsor. 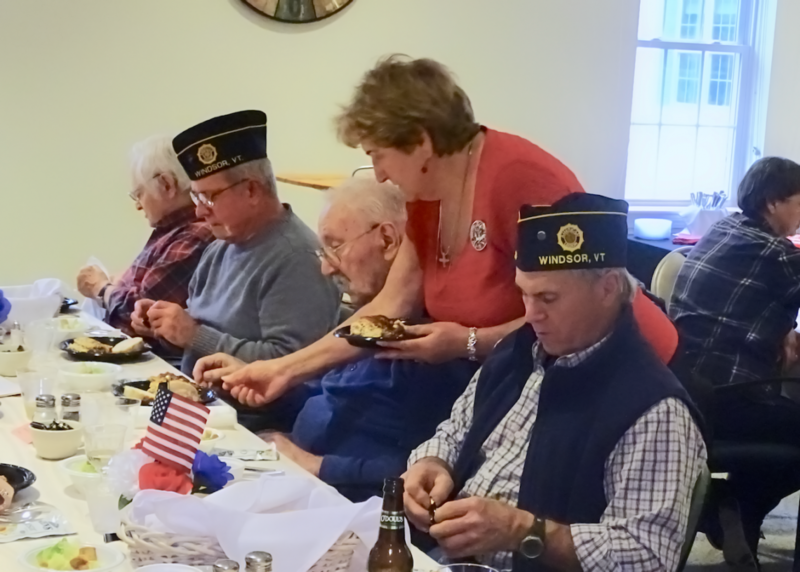 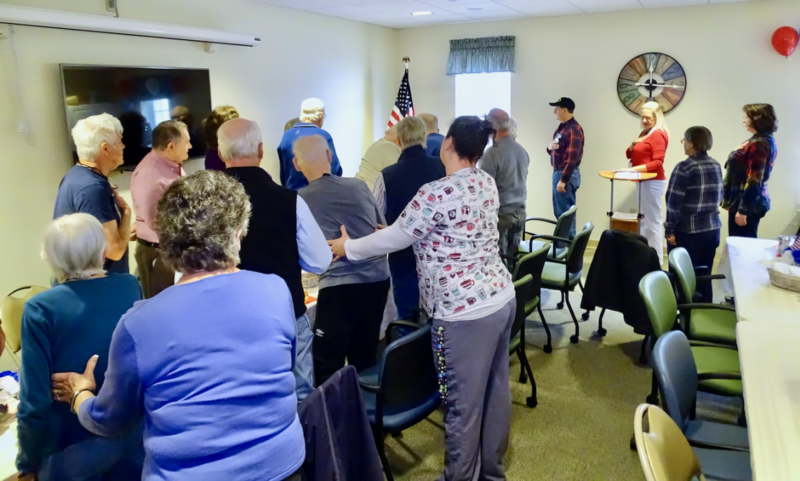 The ceremony began with the Pledge of Allegiance, followed by an opening prayer by Reverend Geri Piper, from the Springfield VT Civil Air Patrol, and singing of “God Bless America” before having a homemade lasagna lunch. 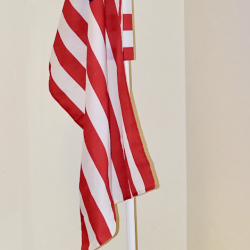 Cedar Hill Maintenance Director and fellow Veteran Earl Knight made a custom-designed flagpole stand especially for the event. 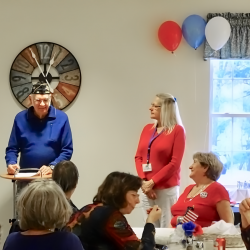 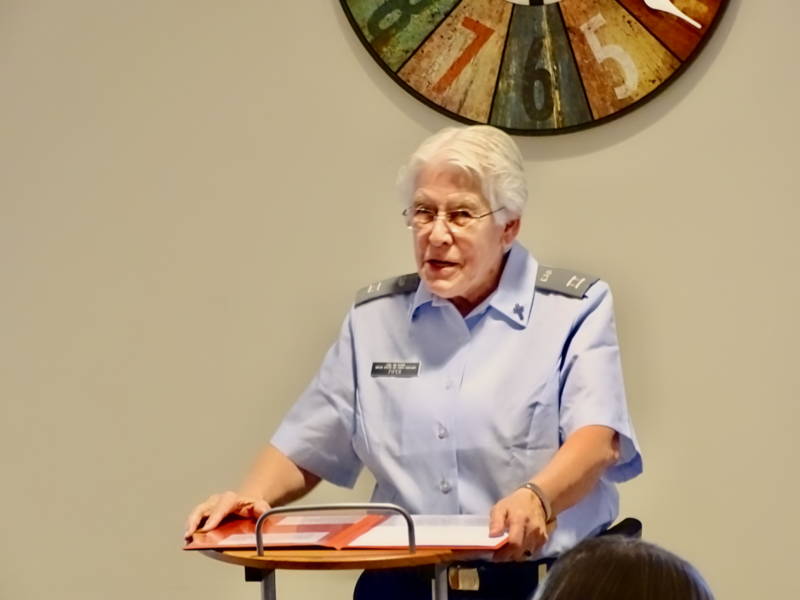 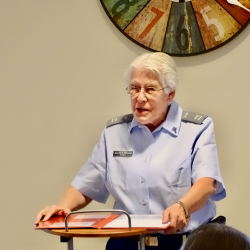 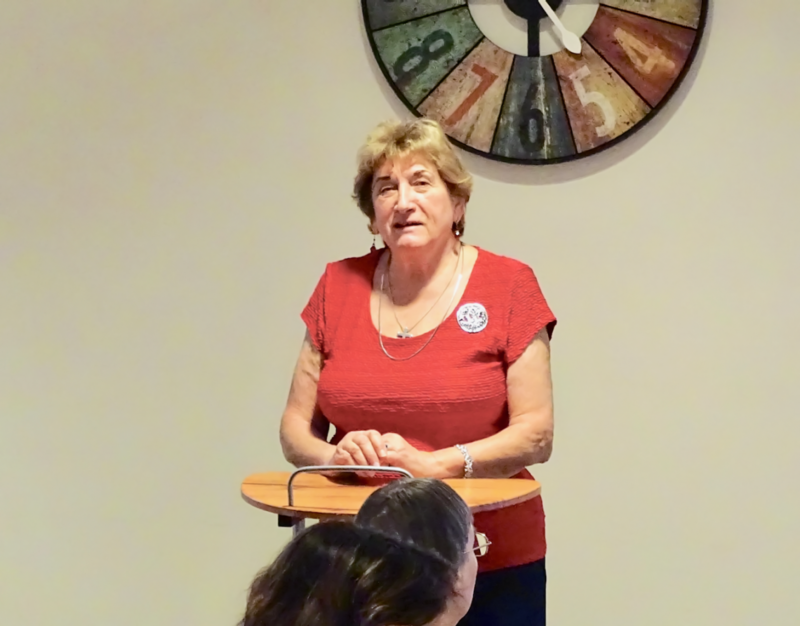 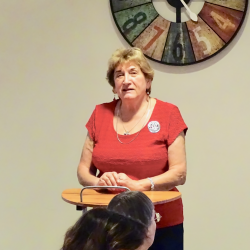 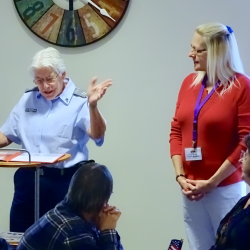 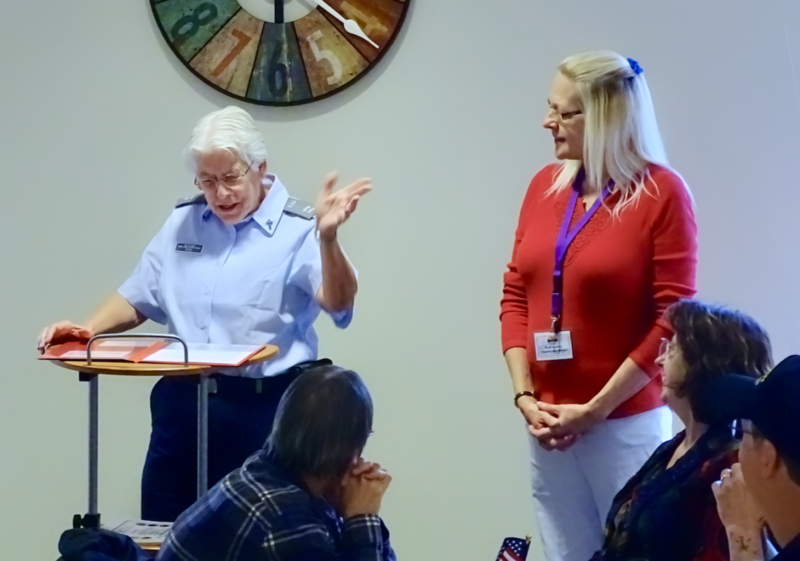 After lunch, Cedar Hill Co-Owner Mary Louise Sayles spoke about her personal connections to Veterans, including her father who served in WWI, and her business partner and Cedar Hill co-founder Judith Brogren, a MASH nurse in Korea. 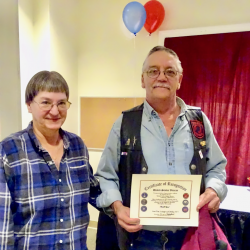 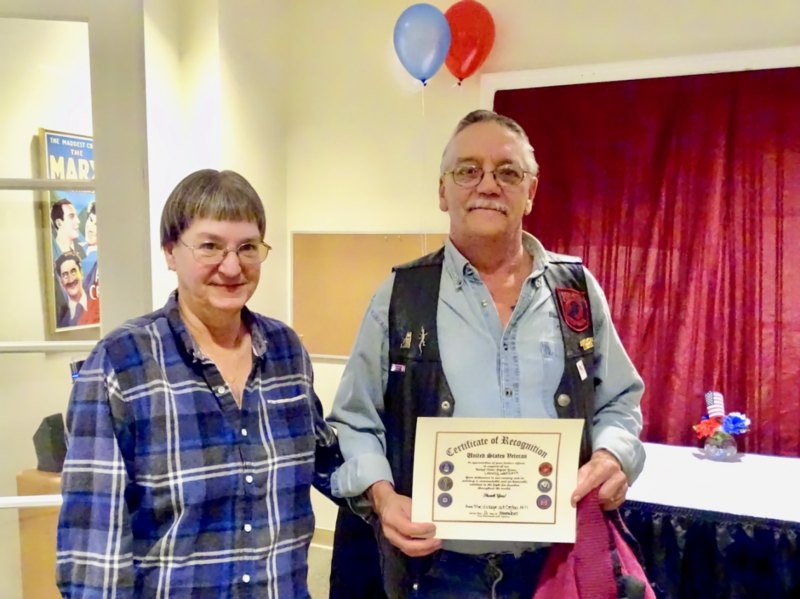 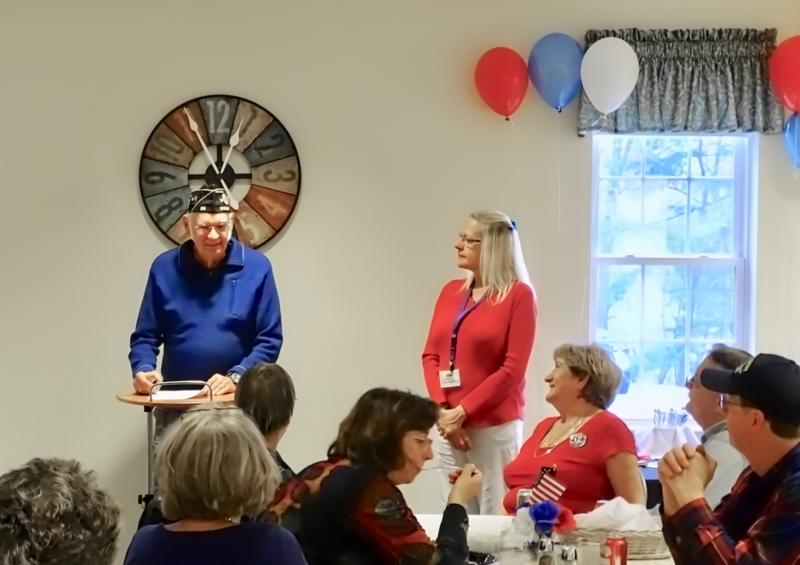 Doug Whitcomb, the Commander of American Legion Post 25 in Windsor, thanked Cedar Hill for inviting them to the luncheon and participated in the distribution of Certificates of Appreciation to all the veterans in attendance.